Joe “Pops” Pizzo was one of Lansing’s most loved citizens. He spent much of his life right here in the Lansing area. Joe, was a fine athlete as a young man…and as he grew into adulthood he had two real passions, he loved to umpire, and did that for many years, and he loved working with Kid’s. 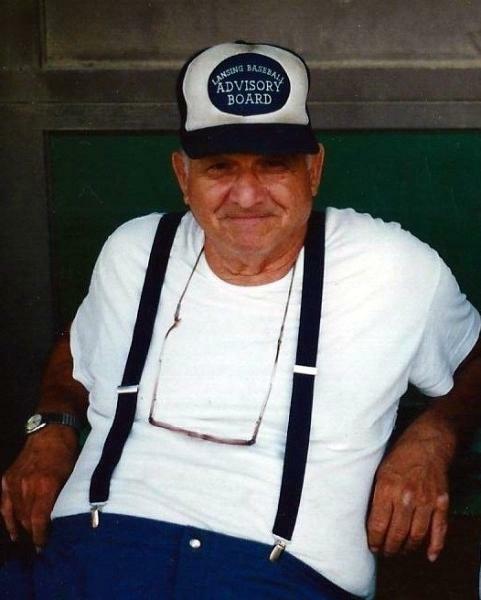 In his later years he accepted a job caring for one of Lansing’s premier baseball field (Municipal Park) and during the years he was the supervisor Papa Pizzo as he was affectionately called created many wonderful relationships with the player and the kids who frequented the park. And for all the fathers who brought their kids to the Park, Papa Pizzo would keep a close watch on them while their fathers were playing ball, just to make sure they were safe at all times. I wished I had a penny for every time I saw him give a kid a piece of bubble gum or a sucker, or even the times he would allow them to come into the concession stand to help wait on the customers…oh they all thought that was such a big deal. Many times you would see Papa Pizzo having a conversation on that famous bench he would sit on to watch the games with the children when they needed a talking to. He truly was every child’s Grandpa, and treated all the children just that way. Even though we lost him many years ago, Papa Joe’s influence is still recognizable today at the old ball park, as his kids as they were called back then continue to play and bring there own children to the park they grew up at. People like Papa Joe Pizzo are truly what makes a place like ours the best place to live and raise a family.